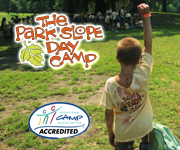 The New York Kids Club, now in its twelfth season, is New York's premier children enrichment center renowned for an exemplary preschool program and creative and innovative kids classes, day camps, birthday celebrations, and special events! 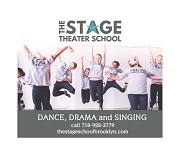 Our unique and original curricula provide children the opportunity to build confidence and express their individuality through participation in physically challenging, artistically enriching, and intellectually stimulating programs. Our brand new, totally renovated Park Slope location is located at 125 5th Avenue. This three story NY Kids Club location features eight premier classrooms, two state-of-the-art gyms, a culinary institute, a dance studio, and an outdoor rooftop play space. Comment: He loves the daily gym time - they have state of the art equipment and always configure it differently so the kids and work on different skills. He loves his teachers. They always get down to his level and are so patient and kind. He loves the friends that he made. As an educator myself, I felt so comfortable leaving him there in the capable hands of the staff. I loved that the teachers give you a summary of their day at pick up and post pictures from the day. Parents feel involved and at ease with their child’s care. The facility is very clean and well maintained. About the facility: Has afterschool options. Comment: I love the amazingly kind and caring staff - they really care for the children. Great facilities and well thought out learning ciriculam. Has outdoor space, Has afterschool options, Has early morning hours, Great gym space! It's one of the more expensive options, so a price reduction would be good! Comment: We also liked a gym class at NY Kids’ Club and Kidville, but the 10 pass thing was slightly out of our price range. Comment: We had a wonderful experience at NY Kids Club last year!!! The facility is clean, organized and provides way more physical activity than any other program I saw. My son flourished in the program. We adored his teachers who we found intelligent and warm. He also attended after school 5 days a week. EVERY single person from the front desk to the coaches and cleaners always greeted us with a smile and made us feel like we were part of a special community. It made Kindergarten a real wakeup call! We loved that they have an app and sent an email everyday about the activities and provided photos of the kids in action. I would HIGHLY recommend it!The only negatives -which I am just providing for a balanced review, is the food wasn't the best (but I have no basis for comparison and it might have changed). The outdoor space was the roof which was pretty sparse (but again - you have the NY Kids Club Gym which is awesome). The only other thing to note is the classes are downstairs so they don’t get a ton of natural light (this didn’t bother our kid at all). Comment: Age of child: 4Venue Review: It was expensive!! The leaders were nice, but a lot of instructions and the kids were separated into groups. Disappointed for what was involved for the cost. Had to pay for the 1 year olds that ended up napping during the party too. Comment: Age of child: 4Venue Review: We had a great experience here! The coaches were kind and warm and went out their way to make things special for our daughter, even making a custom drawing on the trampoline of her favorite stuffed animal. The kids all had a blast playing in the gym and it was great to not have to worry about rain. Also I liked that they were very hands on in the gym space making sure the kids were playing safely, but also gave them time to be silly. It's pricey but if you sign up for their mailing list they sometimes have special offers- we got $150 off the price. Comment: Age of child: 5Venue Review: Great venue for a gym party. Well organized, kids love it and parents can relax a bit! Comment: Age of child: 4.5Review: He comes home happy and exhausted. He is a shy boy but loves everyone at NY Kids Club. They are fantastic and very flexible.What would you change about the program, if anything? I wish they had longer hours. As working parents, 9-5:45 full day is only an option we can consider as needed and not for entire summer. Subject: Kidville v NY Kids Club? Comment: If you are mainly looking for an occasional playspace with a class, I prefer Kidville over Kids Club. We've done both, and while Kids Club will give you a ton of playspace passes, you will be hard pressed to actually get to use any of them..they basically are like cronuts: people apparently feverishly sign up for every possible slot on the allotted Monday at 10 am for the subsequent 2 weeks, meaning that anyone who either doesn't plan two weeks ahead or only wishes to use the playspace time here and there loses out. They give away so many passes when you register early that folks barely ever cancel, so even if you are on the waiting list (which is ridiculous), unless it is sleeting outside, you'd better make other plans. Comment: just wanted to chime in with a vote for NY Kids Club. I've never taken a class or been to Kidville, mainly because they don't seem to offer classes on the weekends. My kid is in school and then after school every day until 6 so our only option for classes is the weekend, and every time I've checked Kidville's site all the classes are offered during the week. We've taking several gymnastics classes at NY Kids Club and been very happy with them and the instructors. I usually convert a lot of my play passes to "events" which allow you to drop your kid in their PJs on Friday or Saturday night (6-8pm) for open play, pizza, dancing and art projects while the parents can have a grown-ups-only dinner. My son LOVES these parties and would go every week if I let him. Subject: August school break - what to do? Comment: I sent this idea to the original poster but it looks like New York Kids Club (5th Ave and St. Johns) goes through Aug 28. My daughter always enjoyed it around ages 4 and 5. Along with time in the gym (which she loved) they have stuff like cooking, dance and art. It is pricey but they allow partial weeks, or at least they did. Also I heard a rooftop playground was opening but not sure of the status. When she went it was all indoors, but the a/c is kind of nice on those sweltering days. Comment: New York Kids Club summer camp on 5th Avenue runs through the end of August. My five year old is currently there (for two weeks) and loving it. Comment: I know NYKids Club has Sunday morning play. But their open play sessions are only for those already taking classes. Comment: There is also NY kids club. My 20 month old loves watching the "big kids" do floor routines and work on the uneven bars. We haven't taken classes for that age of course, but i've been impressed with what the kids can do. Subject: Re: Anyone going to NY kids club ballet I trial class today? Comment: I went to the ballet class today for 3 year olds. No other parents in there, but my daughter didn't want to be left alone. I was pleasantly surprised by the quality of the teaching, the substance of the class, and the ease with which the instructors managed the children. My daughter didn't want to participate at first, but they did a great job of engaging her and drawing her into the class. Having started the class saying she did not like ballet, she now wants to go again. I've not been to other classes there, but I was very impressed with this one.It's a shame that for these trial classes, they discourage parents from sitting in (I had to get a manager's approval in order to stay). Comment: We have been going to the NY Kids Club 2's program this summer in Brooklyn Heights, and will continue there for the fall until their new Wiliamsburg location opens this winter.My son has a speech delay and also has a very hard time in group settings (very shy, needs specific prompting), and I have nothing but good things to say about our experiences at the NYKC staff in Brooklyn Heights, which while not a direct translation to PS still says a lot about their philosophy, programming and hiring standards.My son's teachers were well experienced, and have the familiarity and training to work with my son's needs. The director of the location personally called me the 2nd day of class after my son had a rough start to make sure we got him going on the right foot and even modified their standard protocol to develop a plan to transition my son to a "drop off" class at his pace (it took all summer but he's managed several classes on his own now! )The teachers do a great job of personally getting to know and under each child and his or her strengths and weaknesses, and the programming this summer has been great (my fridge and bulletin board at work are testaments to their weekly themed art projects! )While we have only attended in Brooklyn Heights, I have also had great interaction with folks at several other locations as we were working through options for fall when the Williamsburg's location was delayed in construction.Several friends with children older than mine highly recommended NYKC to me based on their experiences in Manhattan locations and so far our experience has been equally good.